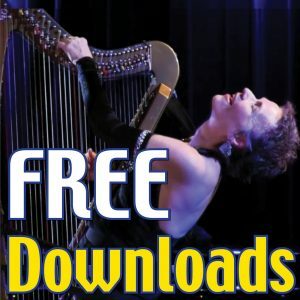 Harp soloist Eleanor Turner debuted my new concerto version of “Baroque Flamenco” with full symphony in New Orleans (June 2014 )- and with 8-piece chamber ensemble in Sydney, Australia (July 2014) . In both concerts, I conducted the ensemble – a wonderful experience for me of passing the baton … while wielding it – turning the performance of the piece to a passionate, masterful soloist – while leading the ensemble that supports her. You can see a video of the New Orleans performance of “Baroque Flamenco” below and link to a video of the full concerto here. In this guest post below is Eleanor’s story of her own relationship with my piece “Baroque Flamenco” which she now performs as a solo piece in her solo concerts — and also as the final movement in the concerto “Soñando en Español” when she plays with symphony or chamber ensemble. It’s a world of mostly female, highly strung individuals (not just a great pun, an absolute harp fact) who desperately seek approval and justification for their art, perfect technique, toned arms, a great husband/roadie and above all, some really impressive repertoire. We have a rich heritage of ‘classical’ music from the 18th century onwards and as far as I can work out, the harp repertoire is built on a foundation of pieces that sound really easy, often disappointingly so, but that take year after year of practice to learn, perfect the techniques, build up enough stamina to perform….and then more years to build up enough stamina (and courage) to perform them all in quick succession in front of an audience of people that just ‘love the magical, dreamy sound of the harp’. Have you ever wanted to wake those people up, with a clinging-to-the-edge-of-your-seat, white-knuckle ride of dazzling harpistry that will knock their socks off, blow their minds, have them up on their feet at the end, applauding wildly and giving you the much needed affirmation of your talent and dedication that you have put into your lifetime of practice and study? That’s why I instantly fell in love with Baroque Flamenco, by my idol Deborah Henson-Conant, whose wild, impassioned image graced the walls of my bed/harp room as I was growing up; my light at the end of the tunnel image, to aspire to be free with the harp as Deborah was – that was why I was up at 4am most mornings to practice. It was a dream to reach up to, and I made it. “Baroque Flamenco” symbolizes for me both the end of one journey (shedding harp-related baggage, mostly) and the start of a new, exciting one – sharing fearlessly with my audience the pure, unbridled passion that I have for my instrument! 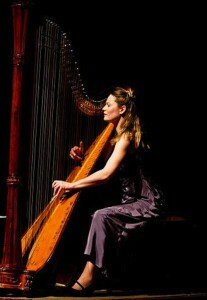 I spend more time with the harp than I do with my husband. More time with it than my friends, my family and even my children! I pour myself and my emotions into it on a daily basis and in return, well, it keeps me sane. Baroque flamenco means that I can now dance with my beloved harp – on stage – and totally rock out in the cadenza. THANK YOU, Deborah! On a more subtle note, I am fortunate enough to play 19th century period harp performances on a beautifully restored Erard harp from Paris in 1820. She is a delicate and elegant lady, named ‘Comtesse’ after her original owner, Felicité, La Comtesse de Genlis, a very important harpist, playwright, letter-writer and harp teacher who lived in Paris from the late 18th Century and was mixing with the most famous of Parisian society, including Napolean. This harp was much later than the stunning single-action harp made for Marie-Antoinette by master luthier Jean-Henri Naderman (and delivered to her in Versailles on her 19th birthday in 1774!) but it gives me a window into that different world. Marie-Antoinette was famously a great musician and much envied as a graceful and highly trained dancer as well. I love to imagine the perfect elegance of Marie-Antoinette as she plays the Rousseau minuet for Deborah’s imagined ball; the twinkle that would certainly have been in her eye as she moved people to dance to her beat, and her sparkling harp playing, fueled by her own love of dance. One can only imagine what would have occurred when her world was invaded by a time-travelling flamenco troupe, but every day I thank God that there is this crazy, passionate, creative whirlwind out there, called Deborah Henson-Conant, who imagined JUST THAT! Join my upcoming “Baroque Flamenco Bootcamp” online course HERE — and within 3 weeks you’ll be playing your own version of “Baroque Flamenco” – sharing your own passion – at your own level of ability.